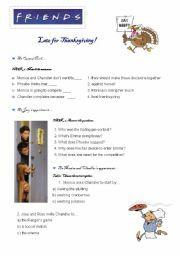 The activity is based on the episode "The one with the late Thanksgiving" (Seaseon 10, episode 08). The chapter is screamingly funny and the kids won´t stop laughing. I suggest pausing the video after the activities and working on the vocabulary. I hope you like it! This is a short activity to do after watching the first two scenes. It is recommendable to do this activity after the previous one (The last chapter of season 1, after which they should imagine an ending). I hope you like it! 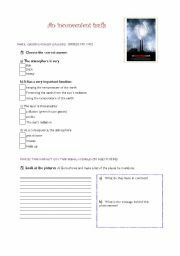 This worksheet is based on the documentary "An inconvenient Truth". Since the movie is rather long, I chose some parts (which are indicated in the worsheet) in order for children to understand the main process of global warming, an not to get bored. It is divided into 5 parts, mostly dealing with vocabulary and conditional #2. 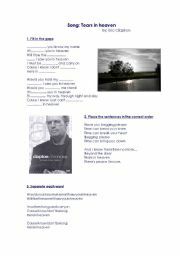 A song by Eric Clapton which includes three different activities to do while listenig. Suitable for teenagers or adults, perfect for teaching conditionals (type 2)! I prepared this activity for my teenagers, I think it´s a great way to start talking about money while learning about people who are "making the world a better place". There are plenty of excersices with the vocabulary, and at last, there´s a writing task (with useful tips for writing and a guideline). I hope you like it!!! 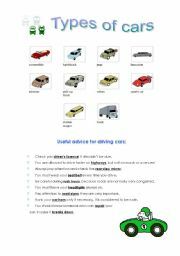 Types of cars and useful vocabulary for students. 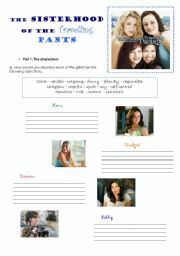 After watching the movie "27 dresses", give the students the summary to complete. 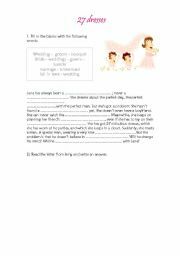 It´s full of vocabulary about weddings. Then, ask them to write a letter answering Amy. 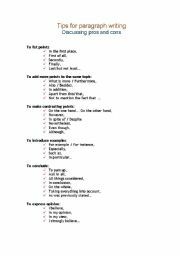 A list of phrases to start writing paragraphs. It´s very useful for giving opinions and discussing advantages and disadvantages. 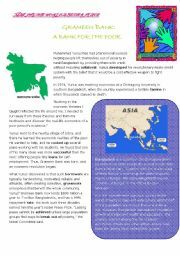 This a short description of the chapter, which students have to complete. Then, teachers should encourage them to imagine an possible ending for the story (that is, the encounter between Rachel and Ross). The activity is perfect for teenagers. THey will love it! The movie centers on a group of girl friends who go on holidays separately, but keep in touch with each other through a pair of trousers that they bought together. There`re activities about the characters and the story itself. 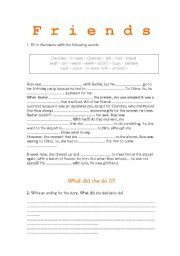 At last, a short writing task. Hope you enjoy it!